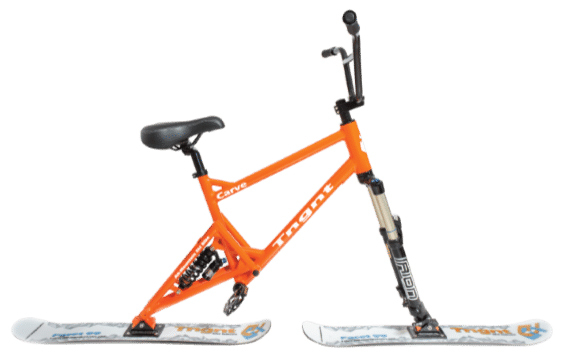 The Tngnt Carve Skibike is a full suspension bike that will give you great performance out of the box! It comes standard with awesome components that allow for an amazing experience on the slopes. One of the best assets of this bike is its price point and its ability to customize it to make it your own. It’s a slick Skibike for the rider who wants to have a solid set of components from the start but may also want to do some upgrading as their riding style develops. Things that can be upgrade are, front fork, rear shocks, handlebars, seat setup, and Tngnts patented ski retention inserts to control ski responsiveness. Demo Condition: These two skibikes are demo bike and have been lovingly used for one season. Cosmetically they show wear but overall are in great condition. We prefer to sell them locally here in CO so they can be inspected first but if we need to ship, give us a call and we can try and work that out.